Dealing with a teenager is much different from toddlers or pre-schoolers. It is a whole new ballgame. 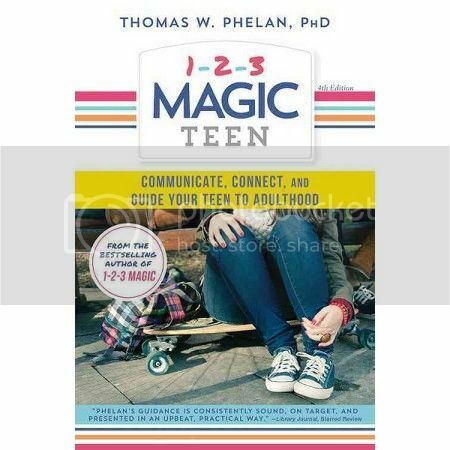 In 1-2-3 Magic Teens-Communicate , Connect and Guide your Teenager to Adulthood the author touches on how the average parent can give the best guidance to their maturing child. Parenting a Teenager is a whole new ball game as compared to a younger kid. They are at a stage where they are discovering themselves and are very vulnerable to the different emotions which they may face. In the book Phelan explains about Straight Thinking in Part 1. In the first five chapters he brings one through the teenager’s mind. There are many dangers that the teenager face today which were non-existent in the past. As a child grows up there are many different things which they face. They are learning more about themselves and may face many different frustrations as they develop their own identity. At this stage in time it is time to change your job description as a parent from a director to a consultant. The goal now is to give them the skills to develop their independence and so they be able to cope with all the tribulations in life. In the other five parts he shows how one can deal with their teenager by changing their mindset together with yours. It is a really new experience for me dealing with a tween. The dynamics between parent and child has changed quite a fair bit. It has been a rather trying experience for me figuring Monkey boy out. Phelan’s book gave me a clearer perceptive on what to expect throughout the teenage years with the main objections/ problems that most parents may face. It was a really refreshing book and certainly worth looking at if you too have kids who are approaching their teens. Disclaimer: I received a copy of this book for review purposes. All opinions are 100% my own. Holy Spirit Mystifying Scriptures by Carol Pitts is a really unusual book that I have recently come across. It combines Art and scripture with a difference. For each scripture passage there is a specially drawn picture which shows the visual meaning of the passage. It was the first time that I saw illustration and scripture mixed together giving the reader a better visual representation of the scripture. Looking at the illustration makes it easier for the child to understand what the meaning is behind the chosen scripture reading. I showed this book to my 6 yr old. She didn’t really like the book as it was hard for her to understand the illustration in relation to the scripture. My 12 year old could relate the pictures to the text better but he too commented that her preferred a having a comic style Christian book to read. I personally found the book rather refreshing to read as it is different from the normal scripture book which one may pick up from the Christian book store. However I too found it hard to relate some of the illustration to the scripture that it was associated to. This was because the illustrations are rather modern day art and not the type that I was use to viewing. If you are into a differentiated scripture reading experience do pick up a copy to view. Disclaimer: I received a copy of this book for review purposes. Opinions are 100% mine.